The friendship between the Bracker Family and Conner Burns began decades ago during Conner’s Residency with Steven Hill at Red Star Studios. A friendship with Conner is one of those types of relationships that seems to have no beginning and definitely no ending, so it was a real treat for us to be able to have him with us for a full weekend presenting an intimate workshop for us and 8 participants from Kansas, Nebraska, Missouri, Iowa and Arkansas! Conner will throw and alter a variety of forms. He will discuss related topics; which will include aesthetics, philosophy, design, technical issues and business practices. Conner will continue to alter forms and add components (such as slab components, handles and spouts) to forms that he made earlier. He will continue to discuss the topics started in the morning and apply the discussion to the developing forms. Conner will step away from the making process and show slides of his work (past and present) and the work that has influenced him (both historical and contemporary). During the slide show Conner will discuss the progression of certain ideas and forms over time concomitant with slides of these forms. He will discuss color and form and the manner in which they work to enhance or distract from the final appearance of a vessel. Conner will pay particular attention to components like rims, feet, lids, spouts, and handles and their relationship to each other and to other components in sets. Non-pottery influences will also be highlighted in his work. Conner will make the final components and assemble multi-component pieces. This will include throwing, pulling, altering and trimming. He will then discuss the relationships between the forms that he made and how they do (or do not) function as a cohesive unit or set. During the entire workshop Conner will discuss his method of firing (single-firing) as it fits; but this afternoon he will focus more attention on the subject. He will focus on the technical aspects, but will also discuss the manner in which it impacts his method of working. He will also discuss the manner in which he glazes and will give a glazing demonstration (if desired). Conner is a studio artist that focuses on the creation of vessels and sculptural artwork. his intention is for his work to look as if it ‘grew that way’ rather than being made. in addition to making artwork, conner travels to teach workshops and to exhibit his work. He continues to change his work and process. studio renovations continue and conner continues to experiment with his processes; using a variety of local materials and adding purely sculptural pieces to his mix. Conner has received recognition and awards from a variety of galleries, art festivals, national clay organizations and art associations. his work can be seen in books about glazes, teapots, cups, bowls and pitchers as well as national periodicals – clay times and ceramics monthly. His artwork can be found in fine galleries and museums across the united states and in private collections in the united states, europe and asia. Conner travels to teach workshops internationally and teaches locally at natchez clay. I single-fire my work in a gas reduction car kiln that i built in 2001. I chose this process because of the early influence of Lucie Rie (no – never met her, just by reading about her). I single-fired for the first time when I bought my first kiln – an electric kiln. 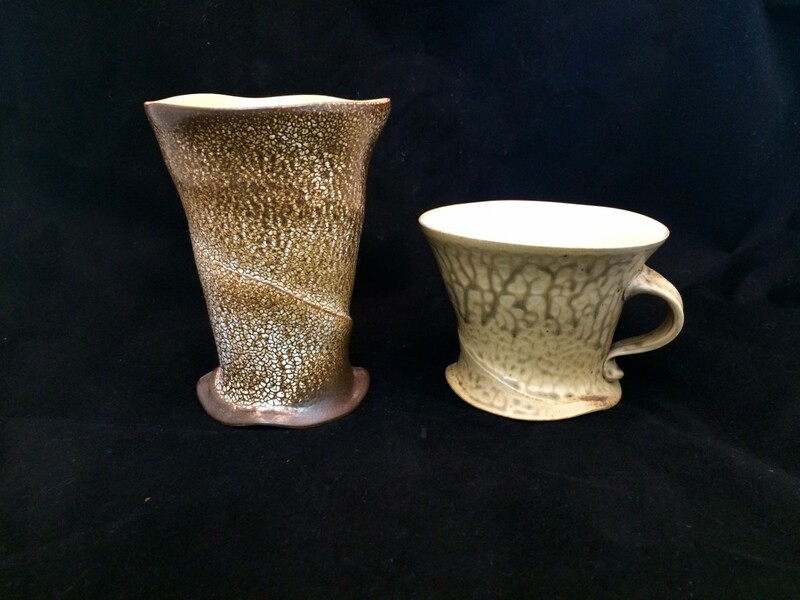 it was the first time i fired a kiln, I glazed my work green and fired it – without experience or directions. although I fired it too fast and too hot – it was still a success. I read as much as i could about that type of firing process and eventually took a workshop from steven hill (who later became my mentor). The glazes i use are important to me. I choose my glazes based on how they ‘fit’ my work. not fit from a technical perspective but from an aesthetic perspective. i want the work to look like that glaze is the ‘only’ glaze for that piece. for example, i am not interested in the response of the viewer to be ‘i love that color’, but prefer for the feeling to be ‘what other color would that piece, that color is the only color that works’. not that it is the only color that work, but the color and the form should both work together so well that it gives a single impression – one cohesive whole. my glazes are a variety of glazes from a variety of sources. i do not have my glaze recipes listed here. they are not a secret, but i have a reason for not listing them. the reason is – they are not my recipes (i did not formulate them) to give. i would prefer for you to go to the source, purchase the book that i obtained the glaze recipe from. the author that took the time to do the testing and write the book will not know how much we appreciate it if the books do not sell – lets encourage the authors to continue to write the books by supporting them. and, most of these books have many good glaze formulas in them, not just the few that i use.